What better way to continue your 2017 riding season fun and to plan your #NextBikeAdventure. View all the great ideas and bike destinations in the latest Minnesota Bike/Hike Guide. Then plan your next outing with family and friends in one of the HaveFunBiking Destinations. This entry was posted in News and tagged #nextbikeadventure, Bike Friendly, bike loops, bike trails, Kasota, Mankato Area Mountain Bikers, Minneopa State Park, Minnesota river, Mount Kato, Mountain Biking, North Mankato, Red Jacket Trail, Sakatah Trails, Seven Mile Park, Southwest MN, Specialized bikes, visit Mankato on November 28, 2017 by Russ Lowthian. 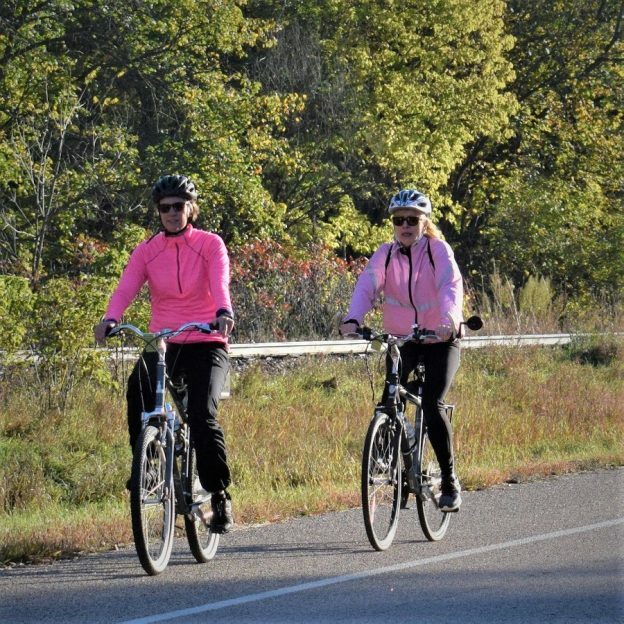 Here, we found these two colorful biker chicks enjoying the fall foliage riding to the trail in Minneopa State Park, near Mankato MN, when the colors were coming into their peak. With the leaves turning and perfect biking weather, we hope you get out on your two wheeled steed and enjoy all the fall riding possibilities along the way. See many more bike-friendly places to explore in the new Minnesota Bike/Hike Guide. This entry was posted in News and tagged Bike Friendly, bike loops, bike trails, MAMB, Mankato, Mankato Area Mountain Bikers, Minneopa State Park, Minnesota river, Mount Kato, Red Jacket Trail, Sakatah Trails, Seven Mile Park, Smith Mills, Southwest MN, visit Mankato on October 26, 2017 by Russ Lowthian. Another beautiful fall day to enjoy a bicycle ride along the trail. 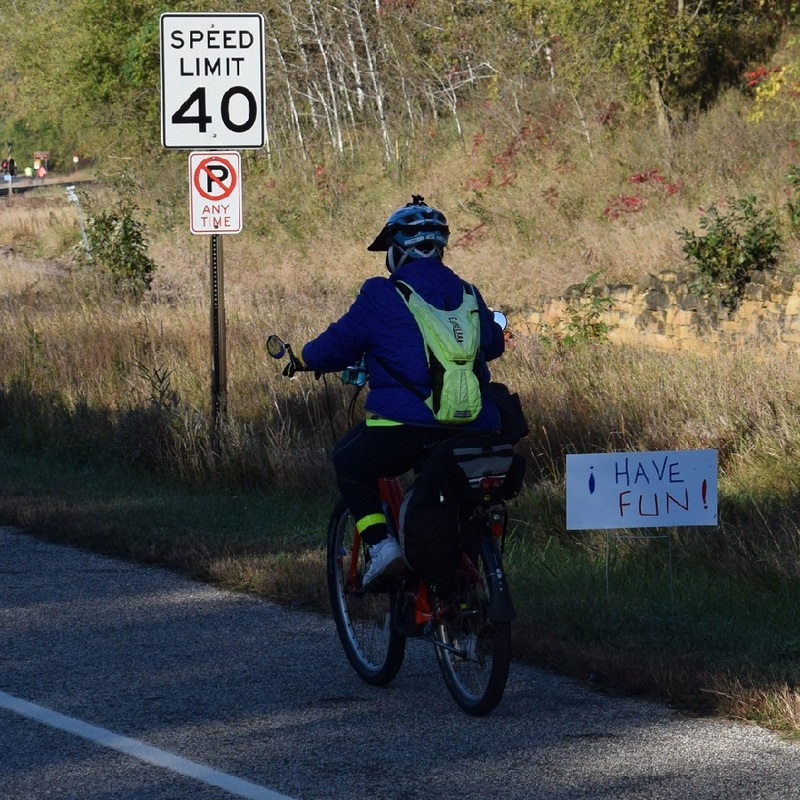 Here in this photo, taken on the Mankato River Ramble are several cyclists riding along the Minnesota River when the colors were coming into their peak. 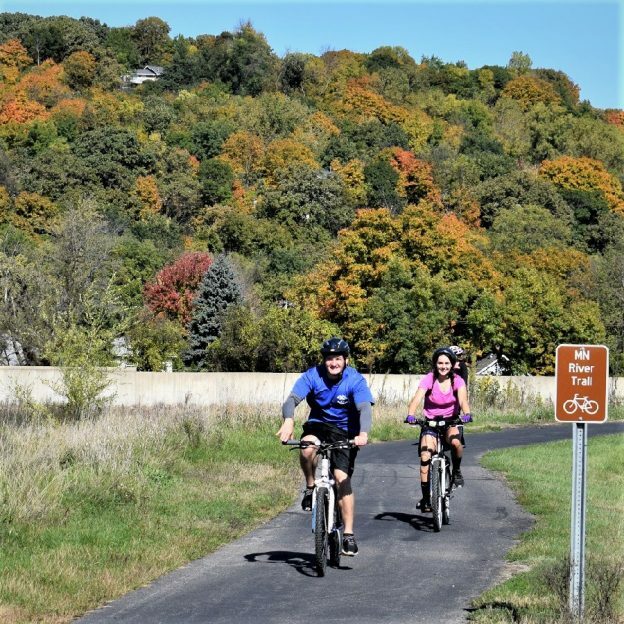 This entry was posted in News and tagged Bike Friendly, bike loops, bike trails, MAMB, Mankato, Mankato Area Mountain Bikers, Minneopa State Park, Minnesota river, Mount Kato, Red Jacket Trail, Sakatah Trails, Seven Mile Park, Smith Mills, Southwest MN, visit Mankato on October 24, 2017 by Russ Lowthian. It always amazes me how bike-friendly Mankato is and this time was no different. 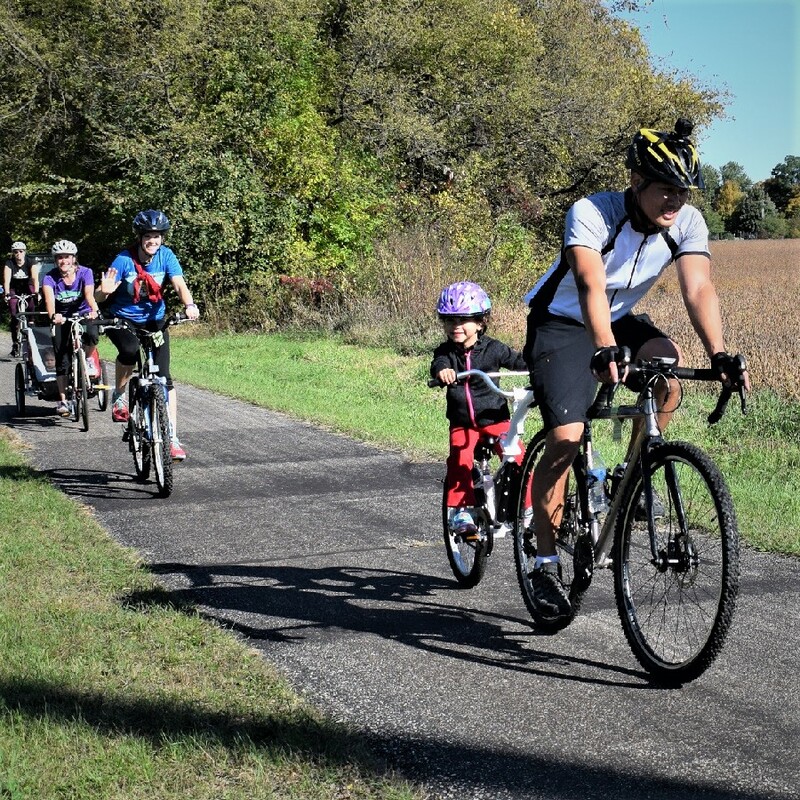 Taking in the Mankato River Ramble Bike Ride, I found several new and safe twist and turns the whole family will enjoy as a bike destination. Tucked along the Minnesota River, in Southwestern Minnesota, its a quick hour and a half drive from the Twin Cities to find your #nextbikeadventure here. The city is located at the point where the Minnesota River and the Blue Earth River merge. This industrialized farm community is actually divided into two, with North Mankato located just across the Minnesota River and easily accessible by bike trail. 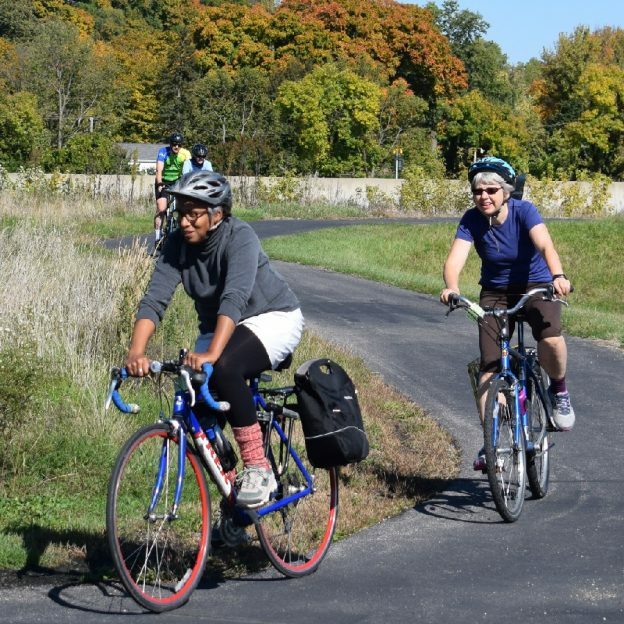 With several trail systems that connects you to the north side, across the river and the many farm communities up on the bluffs it’s a great destination for all skill levels of cyclists. Overall I found my recent visit here fun and easy to get around by bicycle. The bike-friendly roads and trail made it easy to connect from one trail system to the next. Plus, there are countless public bike racks within the area for safe storage. Spending a few days here before the River Ramble, using my bike to get around allowed me an easily way to see the city’s many attractions, such as the Children’s Museum of Southern Minnesota, the rock climbing walls at Minnesota State University and many art exhibits. The presence of the colleges here adds to Mankato’s lively and welcoming atmosphere so you can easily browse of mix of nationally known and locally-owned shops, restaurants, and even venture outside the city limits for a tour of the local winery or brewery. Family fun riding the Red Jacket Trail into Mankato. When you’re in a city that’s been certified as a bike-friendly community by the League of American Cyclists, you know you’ll find endless opportunities for pedaling around. That’s especially true for Mankato, the city and it’s surrounding area are full of walking and biking trail loops and more. So, no matter what kind of terrain you’re looking for, there’s bound to be some road or trail in the Mankato area right for you. The Indian Lake Conservation Area, a 120-acre regional park, has a trail that’s just over 1 mile long. It takes you on small scenic tour of what the park has to offer. There is also the South Route Trail, in Minneopa State Park, that’s just over half a mile long. This trail connects to the North Minnesota River Trail which also connects to the Sakatah Trail. The North Minnesota River Trail also highlights Mankato’s prime location in the river valley at Riverfront Park. Family fun riding the southern end of the Red Jacket Trail. Mankato’s biking loops are a great way to explore the area without fear of getting lost. The Lake Crystal Loop is the most popular among bikers. It takes you south on the scenic Red Jacket Trail, and through the Minnesota River Valley for a very adventurous ride. You can even top it off top this adventure off with some award-winning pie. 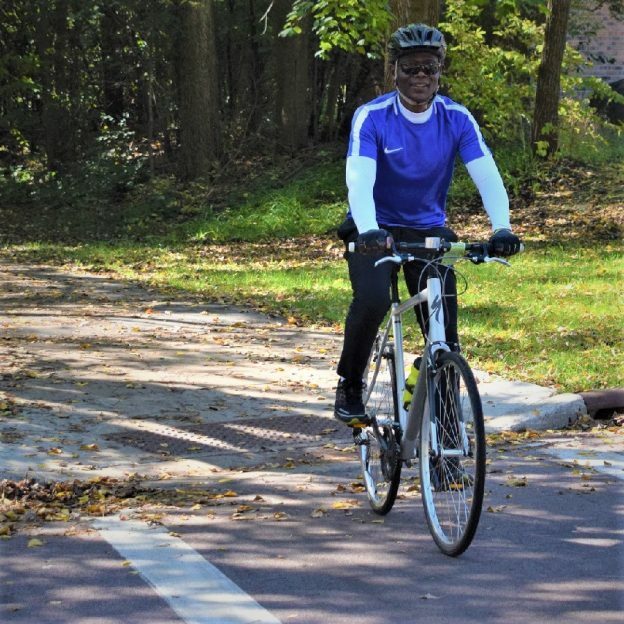 You can also take the North Mankato Loop that mixes trails with low traffic roads, passing by several parks and opportunities to stop for a snack. If you prefer to tour the city, then the Mankato Loop contains mostly off-road trails. It keeps you in town and passes through the Minnesota River Valley. If you feel like venturing outside the city, take the St. Clair/Eagle Lake Loop. It’ll give you a nice taste of small town hospitality, and you can even stop for a picnic in the park or eat at one of the local diners. If you want to explore north of the city, then try out the North Gravel Ride. You’ll ride along the Minnesota River’s bluffs on your way to the prairie land of Kasota. If you want to hit the open road, then try the St. Clair, Smiths Mill, Madison Lake Loop which takes you southeast of the city. If you’re looking for more of a challenge, then behold Mankato’s mountain biking trails. The Ft. LeHillier Trail was created by the Mankato Area Mountain Bikers (MAMB) and offers both an easy and a difficult track ready for your wheels to get down and dirty. Also, check out the Kiwanis Recreation Area, which has four different loop options that total five miles of mountain biking thrills. And lets not forget Mount Kato with over seven miles of wooded single-track trails that caters to all skill levels. Outside of town you can try the trails at Seven Mile Park between North Mankato and St. Peter. It’s a multi-purpose trail system you can use, but watch out for other users. Getting around the city and the surrounding area is relatively easy. 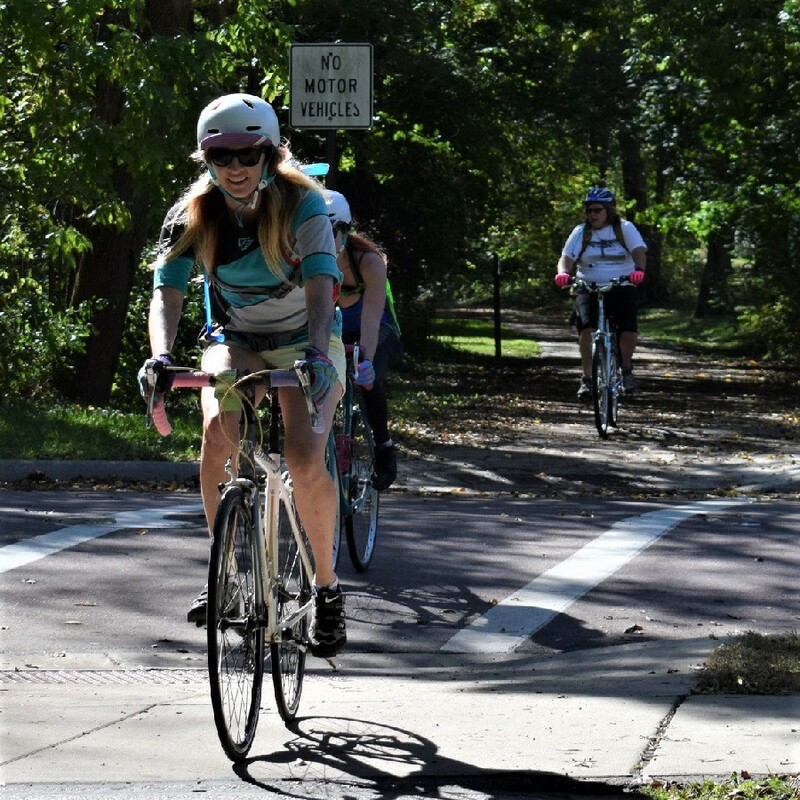 The city’s streets and attractions are essential to making Mankato a bike-friendly destination. As for the surrounding area, there are plenty of roads that you can take to navigate around the area. Many of the loops mentioned above include using roads to follow the courses. However, each road differs in the amount of traffic and the amount of shoulder it has for riders – so stay alert. Be sure to check out our At-A-Glance Mankato Article for more details on where to stay, play, and explore for your hand-held devises. As this story and the At-A-Glance Article are mobile-friendly for your convenience, have fun! Have Fun riding in the Mankato Area. Now with fat bikes, any time of the year is the perfect time to visit Mankato. 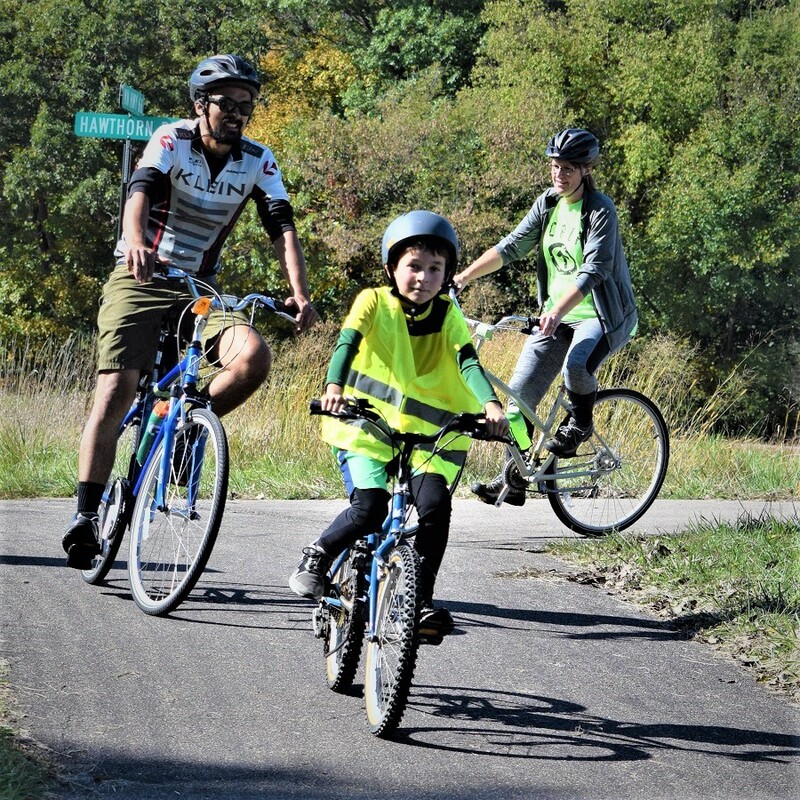 This entry was posted in News and tagged #nextbikeadventure, Bike Friendly, bike loops, bike trails, Kasota, League of American Cyclists, MAMB, Mankato, Mankato Area Mountain Bikers, Minneopa State Park, Minnesota river, Mount Kato, Mountain Biking, North Mankato, Red Jacket Trail, Sakatah Trails, Seven Mile Park, Smith Mills, Southwest MN, St. Clair, visit Mankato on October 9, 2017 by Andrew Ellis.